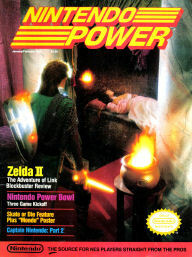 Back in 1988 and 1989, several of the first issues of Nintendo Power featured the Legend of Zelda series. The original Legend of Zelda was featured in the first ever issue of the magazine, and also had a bit of information in the second issue. It wasn’t until the 4th issue that Zelda made its first appearance on the cover of Nintendo Power, and this corresponded with the featuring of the Adventure of Link. The 4th issue of Nintendo Power included a ton of information, artwork, a fold out map of the overworld, as well as a walkthrough for the first four palaces in the Adventure of Link. The following issue of Nintendo Power also had a large section devoted to the Adventure of Link, with a walkthrough for palaces five and six. That’s not it though, as there were numerous mentions of both the Legend of Zelda and Adventure of Link throughout the magazine in various sections. I’ve uploaded the Zelda related portions of issues number four and five and you can check them out at our Zelda Publications section of the website.